Whether you want to make a special gift for a graduate or need some graduation-themed decorations, these craft projects should fit the bill. Do you know a graduate who's headed off to college or a new job? You can make a special care package to ease homesickness and show your love. Make a no-sew fleece blanket by snipping a three-inch fringe all the way around the fleece fabric. Tie each strip of the fringe to give the blanket a finished look. Use the rubber stamp to decorate the plain white mat. Have all the family members write encouraging messages around the mat. Assemble the picture frame with the decorated mat and your family photo. Tuck the hot chocolate mix into the mug. Pack everything in the fabric tote bag. This graduation cap invitation is easy to make, and it will give your open house a touch of personal style. Cut the cardstock into six-inch squares. Cut the party details printout to the same size. Place the party details and cardstock squares together. Pierce the center of both sheets with the scrapbooking brad. Tie a tassel around the brad on the cardstock side of the invitation. Across the cardstock, write a message of congratulations for the graduate. Hand deliver the invitations or purchase blank envelopes at your craft store. A personalized name banner is an easy and affordable way to add a custom touch to any open house or graduation get together. This craft is also appropriate for younger kids, so everyone can get involved in the party. 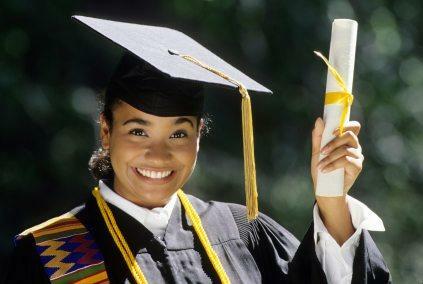 Use your word processing program to write the graduate's name in capital letters and enlarge it to about 300pt. Print the letters and cut them out. Carefully trace the letters onto the cardstock using the pencil. Cut out the cardstock letters. Use a paint brush to apply an even coat of white glue over the surface of each letter. Sprinkle glitter over the surface. Allow all the letters to dry completely. With the hole punch, make two holes in the top of each letter. String the ribbon through the holes to create a banner. No matter which graduation craft you choose, it will be special because it's handmade. Nothing shows you care like a gift or decoration you created yourself.